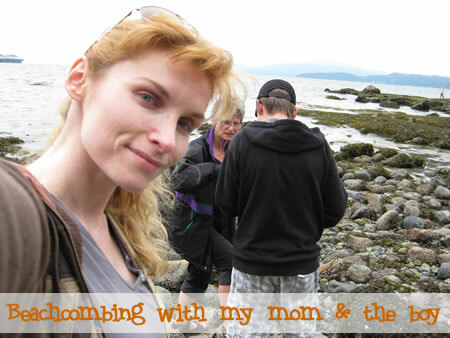 My mom flew out to BC a few days ago for a quick visit before heading down to see my sister. My sister is having surgery & with a retired nurse for a mom, who better to look after you! Her hubby is great & all, but with 2 little boys on summer holidays, I’m sure he’ll have his hands full. I love that my mom is so easy to entertain. We literally spent 3 hours walking, exploring the rocks, hunting tiny crabs & then walking through the trees picking berries. It must be blackberry season because we picked (& ate) enough to make an entire pie. Yum! 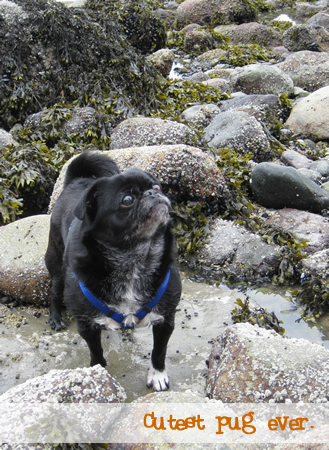 The pug was in heaven too. Rocks? That look like balls? IN THE WATER??? Digdigdigdigdigdig. I swear he could stay there all day just running around & digging at random rocks, trying to get them out of the water where surely they will magically transform themselves into balls. 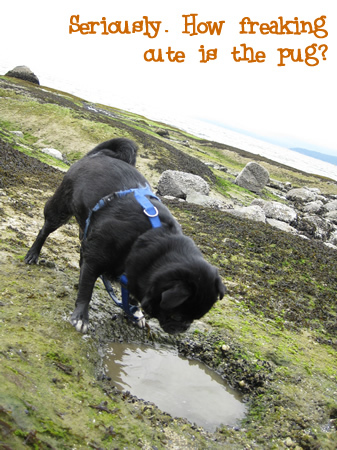 On this particular day, the pug was right; he found a pool ball! A Kelly green number 6 billiard ball, right on the rocks, in the ocean. You find the strangest things when you’re beachcombing.